Search Engine Optimization (SEO) is dynamic… it continually changes… and for good reason… it keeps the players and the game honest and striving to improve. Here are seven SEO trends to watch out for in 2014 and beyond! FREE Report => 7 Deadly Sins of a Poorly Designed Website! A lot going on these days in the world of SEO. What’s critical to you the business owner to understand are what’s relevant, what are the high impact areas that you really need to focus in on and make sure that you are mastering for your business in order to succeed going forward. SEO is more relevant than ever, as a matter of fact it’s become more difficult and complex. The key is to make sure that you understand what it is that you should be looking for. 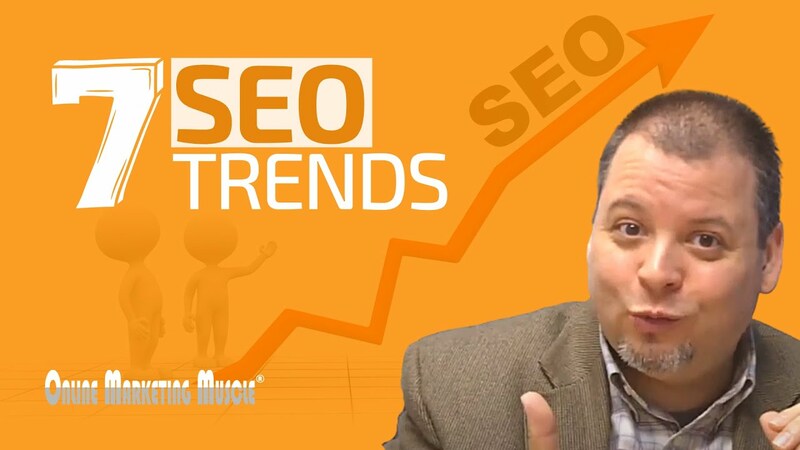 OK, I’m Dean Mercado from Online Marketing Muscle and what I’m going to present to you here today is what I call my seven trends in SEO for 2014 and beyond. So let’s dig in. Number one. Keyword research, when it comes to keywords, keywords have always been part of SEO and probably always will. However, it’s a little bit different these days where we are talking about we’ve gone from keywords to concepts. Keywords to concepts. So it’s not about taking the same keyword phrases and stuffing stuffing stuffing throughout your entire website or any piece of copy you ever put on the internet. It’s about samantically connecting concepts together and the Googles of the world and the search engines of the world have gotten smart enough to understand how conceptually things fit together. So we’ve gone from keyword to keyword concepts and that’s a big big trend to understand as you’re designing for the internet these days. Second big point I want to bring up and this is kind of always been the case, but more so now than ever, content is king. Content is king! More so now than ever. So trends we’re seeing there are longer copy seems to be working very well across the internet. Looking for pages that have not just 250 words, but maybe 1000 words of really relevant unique almost all-inclusive content about a specific concept. Remember that from the keyword research and keyword stuff, the concept. So having pages that are focused on a specific concept. More voluminous definitely works. We’ve seen that trend moving into fruition with things like Squidoo and HubPages. Things like that where you are seeing these almost one page websites being created about a specific concept. A third big area and this third big trend or area really encompasses these next three that I’m going to share with you, but it’s big. It’s what I call brand or domain authority. There’s always going to be more credence given to a brand that seems to have more legs, seems stronger, seems more reputable than a brand that doesn’t and it’s really that simple. Now how do we do that? How do we get the brand to be more reputable? There are a lot of ways to do that. Number one longevity in business, how long you’ve been there. Things like that do matter. How long you’ve owned your domain name, things like that do matter When we talk about linking strategy what’s really changed from the way SEO used to be to the way SEO is today is more so quantity isn’t the big factor anymore. So having 5,000 links coming back to your website from Joe’s Burger Shack out of state somewhere really isn’t going to help you much. But having really relevant quality links from high quality lead domains, high quality brands linking back to you showing that you are somebody to be reckoned with, that’s really really important. As you look at your linking strategy you want to go for quality, not quantity. And you may even be finding that some links that you had may actually be hurting you. If those are from sites that really don’t add value to your brand, so it’s something that really needs to be looked at. We’re going for quality, not quantity. As we continue on alongside this branding and the authority, the next big item that I want to include here is what we call social proof. It’s one thing if you tell me you’re the greatest thing since sliced bread, we take it with a grain of salt. If I’m seeing that everybody across the internet is saying you’re the best thing since sliced bread it holds a little bit more weight, don’t you think? Here we’re looking for things like citations, having other sites mentioning your company’s name, your company’s phone number, your company’s address. Other third-party reputable sites. We’re talking about reviews, people reviewing your company online on however many review sites. That always is going to hold more weight showing that you’re a credible resource. As well as things like what we call social signals. This is your activity on social media and how much people are sharing the content that you’re sharing on social media and sharing that you might be posting on your blog on social media. Those are social signals. Very important. Also things like the engagement you’re getting. So when you are posting things are people commenting on those things? Are they engaging you in conversation? All of these factors are playing into your brands authority. Your brand’s strength. The social proof saying that you are as good as you think you are. Very very important. Two last trends I want to share and they may seem obvious, they may not seem obvious but whether they are obvious or not go after them. Things are going local. You’re seeing the internet really put and the search engines really put a high focus on the local side of SEO. Things like citations and reviews as I mentioned before playing a huge critical role these days. How you structure your site and the things you’re saying on your site, are they catering to a local audience? So especially if you are a business that serves a local market. Critically critically important, but we are seeing things really move toward local and a lot of weight being put on how you address localizing your online presence. And then lastly, the seventh trend that we’re seeing is things have gone mobile. I mean it’s not even that they are going, they’ve gone mobile and you need to show that you’re going with it. So your website needs to be able to accommodate the local, the more global side of things, it needs to be responsive. Even if you have to go as far as creating a separate mobile site, whatever it takes. Things have gone mobile. And the search engines are paying attention to how you’re responding to it. As well as your audience, I mean forget about search engines, your audience is paying attention to it. Take a look at Google Analytics, your statistics and just take a look at how much of your traffic is viewing your website via a mobile device. Tablets, phones, period. Those are seven trends you really need to really key in on. I’m going to go over them quick. Keywords, going after concept now right, content is king, we want to see that you know that you really know what you’re talking about, go after it. Your brand and domain authority, your linking strategy, your social proof, things have gone local and things have gone mobile. I think that’s seven right? It’s a lot of stuff, but it’s a lot of stuff that you need to pay attention to in 2014 and beyond. Here’s to your SEO success. I bid you good luck, it is a lot of work but you know what, you’re investment in this area is critical and there’s a lot of this stuff that you could do on your own with a little bit of knowledge. OK, so I’m Dean Mercado once again for Online Marketing Muscle. Take care.